For five decades, Harry Parker and Harvard Rowing were synonymous. No college rowing coach has had greater influence—or greater success—than Harry. It is safe to say that no one ever will again. Harry’s competitive record with Harvard is justifiably well known, but his methods are far less widely understood. How did he do it? Harry thought of himself as a teacher, but his athletes experienced him primarily as a leader. We think of teachers as articulate purveyors of knowledge dispensing information to their pupils. Harry wasn’t one for lengthy explanations. He acted as an educator, one of great character, who modeled the behavior he wanted from his athletes and who taught young athletes to learn for themselves. Harry relied less on verbal instruction than on creating an environment that exposed athletes to situations they could learn from. Two boats duking it out side by side taught everyone on board everything they needed to know about racing, teamwork, persistence, and themselves. This was experiential education in action. Athletes improved and gained greater understanding, of the sport and of themselves, by doing rather than by being told what to do. Words were often considered superfluous and thus seldom uttered. In Harry’s practices, motivated individuals would learn for themselves and learn from each other. Harry seemed to see sprinting as more of a natural gift, while endurance revealed character and inner FORTITUDE. Perhaps above all else, Harry believed in the value of opportunity. Though incredibly demanding, rarely did he verbalize his expectations for his athletes. Most coaches clearly state what they expect performance-wise of their athletes. Not Harry. He wouldn’t limit his athletes by imposing expectations on them. Rather, he challenged them to seize the opportunity at hand. Doing one’s best was what mattered, not an arbitrary standard defined by a coach. You never knew with Harry whether you’d done enough. There was an uncertainty that left you feeling you could always do better. He rarely appeared satisfied and many went to great lengths trying to impress him and earn his approval. Harry’s coaching wasn’t vague or ambiguous, it was just opened ended—always open to the possibility of something more. Harry would compliment a crew following a loss. He would give positive ENCOURAGEMENT to lift his oarsmen’s spirits. After a victory, however, he would more often motor off. Harry would compliment a crew following a loss. He would give positive encouragement to lift his oarsmen’s spirits. After a victory, however, he would more often motor off. The implicit message being that while good for today, bigger challenges lie ahead, more will be necessary, and you can do even better than you previously thought possible. Every athlete who stepped foot in Newell Boathouse understood what those who came before him had accomplished. The photographic evidence and hardware are everywhere. All this tradition and history could easily have become a heavy burden, but under Harry’s coaching, it simply represented all that was possible. It was never, “Live up to the tradition.” It was always (unspoken), “You too can do this.” Harry turned Harvard’s previous success into a liberating aspect of his coaching. He freed guys up to focus on simply doing the work rather than worrying about the outcome. The responsibility yet again rested on the athlete, but so too did the opportunity. Everyone knew that Harry had made crews fast in previous years. They knew that they too would benefit from his coaching and, as such, needed only to attend to their training and make good decisions away from the boathouse. Harry fostered an environment of focusing on the process, not the outcome. It was a process every single one of his athletes, regardless of innate talent, could engage in equally. Harry believed firmly in maintaining a large squad and, more than almost any of his peers, he structured his training to encourage broad-based participation. He ran a flexible practice schedule to accommodate different academic schedules, on-campus jobs, ROTC commitments, and more. He never cut a student for lack of athletic ability. Part of this was his belief that rowing should remain inclusive and not restricted to experienced oarsmen. He wanted people to learn rowing as novices in college like he had done. He hoped others would find it just as meaningful and enjoyable. Equally important, he believed in the competitive advantages of a large squad. More guys actively rowing meant more guys to beat the opposition with. It meant more options when confronted with injuries and illness, more internal competition, more of a presence on campus, and more athletes in the pipeline. Athlete development, helping people improve and get better, is a lot more rewarding than recruiting. Harry was late to embrace recruiting partly because he so enjoyed teaching; helping guys progress through the ranks and climb from the second freshman boat to the third varsity to possibly the varsity. This was a big part of his coaching. The numbers were also necessary to train the team the way he wanted to. For much of the year, Harry emphasized mixed boats in his training. He firmly believed in developing more athletes and did this effectively by regularly boating even lineups. He also did this to create a more competitive environment within the squad and for selection. He wanted guys racing each other. This both made training more fun and also more realistic preparation for race day. Additionally, it had the benefit of making every individual responsible for the performance of his boat. With Harry, guys quickly learned that they couldn’t wait for ideal conditions or their preferred lineup (or even the right equipment) before performing. Everyone was accountable in every competitive situation and learned to produce their best regardless of the circumstances. In many years, Harry’s crews were not necessarily the prettiest, but they were generally among the best racers. Rowing mixed boats in March is a perfectly acceptable form of preparation for racing season. 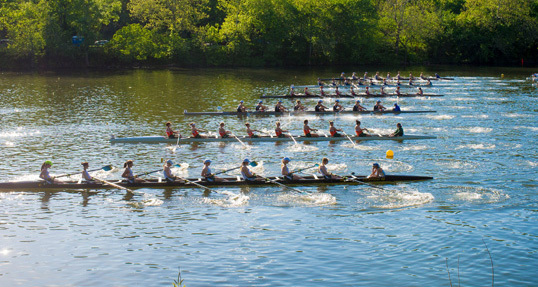 Harry’s commitment to even boats, however, was so great that in 2004, following Harvard’s sweep of the Eastern Sprints, he broke up the 1V and 2V in the lead-up to IRAs. At this time, the 1V was enjoying its second consecutive undefeated season and the 2V had won every race other than the previous IRA. Harry wasn’t afraid to shake things up in pursuit of more speed. He valued a competitive, unpredictable training environment more than he did stable lineups. He didn’t do this specifically to open up selection, though it had this benefit too, but to get back to uncertain racing situations. He disdained the predictability of the 1V racing the 2V, as it rarely produced the absolute best performance from either crew. Even boats required the athletes to perform at their absolute best in order to succeed. It created the opportunity for them to find out what they were capable of; to discover, as best they could before race day, how hard they could go. This effort and skill is just what the IRAs and Henley would require of them. On the water and in the tanks, Harry liked to do a lot of progressive pressure and progressive rate work. He would frequently do pieces starting at moderate pressure and build up to full pressure. This training didn’t improve physiology as much as other work did, but it helped solidify rowing skills. It allowed rowers to begin with their best skills. As the pressure and/or rate increased, each athlete would struggle to maintain their effectiveness. As they struggled, they would gradually learn to retain their technique and length despite the increased effort. This challenged his athletes to maintain their effectiveness as fatigue set in. Another way Harry regulated effort was to introduce varying levels of competitiveness. If a single boat was training on its own, then the command “full pressure” would elicit a strong effort. If two or more boats raced head style up the Charles, “full pressure” generally brought forth a stronger effort. If two or more boats raced side by side in the Basin, then “full pressure” became an entirely new category of effort previously unseen. Harry didn’t tolerate less effort from a crew when it was on its own so much as he created competitive situations that inspired people to generate more effort than they previously thought that they could. Personality aside, Harry also knew that our sport rewards endurance. Psychologically, without seeing the opposition when you’re behind, an athlete has to believe in his ability to stay strong and come back as the race progresses. He trained his oarsmen to have this belief. Physically, a single 2k is primarily an aerobic race. Most of the best racing Harvard did involved more than a single 2k. Eastern Sprints required two superlative 2ks in one day, the IRA national championships required three races over three consecutive days, and at Henley it could be as many as five two-plus kilometer races over five days. All of that aside, it was Harry’s love and fascination with The Race, Harvard’s annual four-miler with Yale, that fueled his endurance-based training regime. People would ask Harry following the Sprints how in the next two to three weeks he planned to adjust his training to prepare his charges for the substantially longer four-miler. You could almost see him laugh to himself; he’d been training the crews for the four-miler since September. For nine months every year, The Race inspired Harry’s training of Harvard’s crews. This endurance training took many forms, but his favorite was controlled rate work of eight to 12 minutes in duration. Decades of Harvard oarsmen are familiar with competitive pieces of this length. In the early years, they did “Basin shots” side by side in the Charles River Basin: 2,500 meters at rates that ranged from 24 early in the spring to 30 in the racing season. More recently, as the river became more crowded, he assigned the work head style between the Belmont Hill Boathouse and North Beacon Street. Harry knew, as many others do too, that limiting a crews’ ability to use rate required them to row harder, longer, and better to make the boat go faster. With Harry it was always about power. Racing on the Thames River in New London, Conn., could be, in another classic Harry understatement, “challenging.” Conditions there could severely test crews and those who persevered in rough, tricky water would often earn the victory. While The Race could be extreme, Harry also saw that any set of conditions (wind, weather, current, waves, tide) could influence how a boat rowed, and consequently how it performed, on race day. Because of this, Harry would devote practice time to training in the anticipated race-day conditions. He would habitually seek out conditions that would replicate those forecasted for race day and have his crews row in them. The training would be less for physiological development and more about getting the anticipated feel for the race. “This is what it’s going to feel like on Saturday,” he would advise. Harry’s most meaningful talks to his crews would occur days in advance of racing and focused on psychological preparation. He stressed only the possibility of victory; never ever did he speak of it as a probability. He told his oarsmen to “have faith in yourself, your training, and your teammates…know in your gut…decide ahead of time that you will not be out-pulled.” In his final year, he instructed his varsity at Red Top to “red-line it,” a frightening command to those embarking upon a 20-minute race, but when delivered by Harry, a confidence booster. Harry stressed that what had been done thus far was necessary for victory but what each man would do during the race would determine the outcome. By speaking to the crew in this way days before the race he gave each athlete the opportunity to internalize what he’d been told. He gave them the time to adopt Harry’s belief as their own. Harry was so RETICENT compared to other coaches that his few pep talks became the stuff of boathouse lore passed down through the generations. Once race day arrived, Harry had little to say. Seldom did he engage in pre-race pep talks. The few words he spoke would address the conditions and possibly the opposition’s tendencies. The Harvard race plan might, at most, consist of a planned 10 and 20. Harry was so reticent compared to other coaches that his few pep talks became the stuff of boathouse lore. In the early ‘70s, he told one varsity, “Those guys are very good. You’re going to have to race very hard to beat them.” That was it. He walked away and left them to launch. Before the final of the San Diego Crew Classic one year, he told a particularly good crew to “Go out there and revel in your greatness.” Again, nothing more. What more needed to be said? Each athlete had already taken advantage of the opportunities given to him and improved by embracing them. Each had trained in demanding conditions and learned from them. Each had been tested by their teammates. Harry’s training had prepared them to race. And they knew it.